During May, 2017, 16 undergraduate students accompanied Environmental Studies Professor Dan Klooster, GIS Professor Nader Afzalan, and Center for Spatial Studies Staff members Steven Moore, David Smith, and Nathan Strout for a three-week May term class at the Preserve. The students began a multi-year project to use field research and drones to map watershed boundaries, stream courses and riparian habitat, trails, and classify habitats according to vegetative structure and potential for carbon sequestration. Over the next three weeks, the students would bushwhack through dense thickets of rainforest to identify tree species and measure vegetative densities, fly drones to map a micro-watershed, hike watercourses and trails with GPS receivers, meet with Guna leaders, visit indigenous villages, and encounter torrential downpours, snakes, scorpions, and bullet ants. 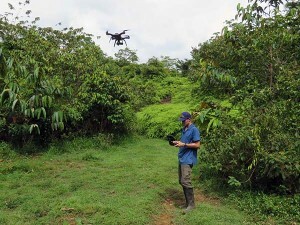 "The goal of this course was to immerse students in the Mamoní Valley ecosystem with field research with field research in which they gathered forest mensuration, drone, cultural, and other kinds of data," said Professor Klooster. "By integrating this data into a geodatabase, analyzing the data and reflecting on their experiences, creating story maps about they had learned, and presenting their work to key stakeholders in Panama City, the students came away with a deep connection to and appreciation for this special place. They also learned a lot about the challenges and opportunities for conservation in places like Panama." In addition to mapping the preserve, students took excursions to explore the caves of Lago Bayano and visit an Emberá village, experience the indigenous fishing and ecotourism culture of the Guna Yala on their archipelago off Panama's Caribbean coast, and encounter the contrasting modernity of Panama City with its UNESCO World Heritage neighborhood, Casco Viejo. "Panamapping was one of the toughest experiences I'll ever love," said one of the students who completed the May Term course. "I faced a lot of challenges that I learned to overcome. Working in the rainforest could be really difficult, but I enjoyed it. The place is so alive. I want to go back."